In a medium pot over medium heat, combine the rhubarb, strawberries, sugar, cornstarch, orange peel and salt. Cook for 5-8 minutes, or until the rhubarb is tender and the mixture starts to thicken. Transfer the mixture to a baking dish that is about 9 inches. Open the can of biscuits and separate the biscuits. Cut each biscuit into 4 pieces. Place them over the rhubarb mixture. Use a cooking brush to coat the biscuits with the melted butter and sprinkle with the coarse sugar. Bake for 12-17 minutes, or until the biscuits are golden brown and completely cooked. You may serve with whipped cream, vanilla ice cream or yogurt, if you wish. You can make them in individual portions. If you’d like, you may add slivered almonds and garnish with mint leaves. Use as many biscuits as you wish. If you have any left over, set them aside and bake them according to package instructions. 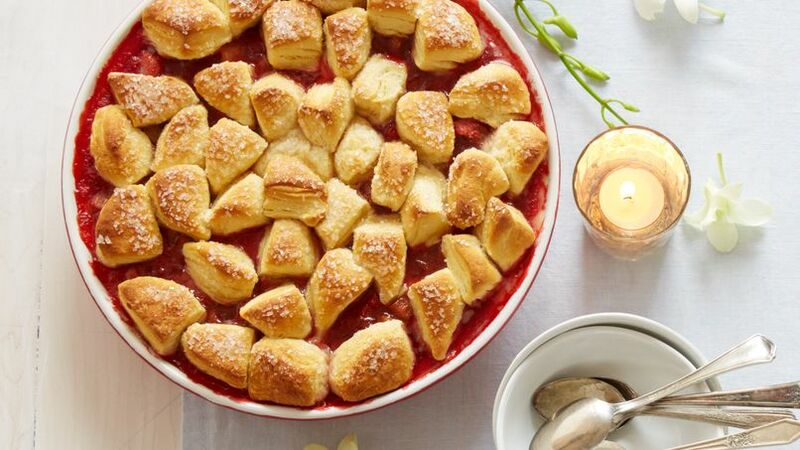 Oriana Romero This fruit cobbler is perfect to serve for brunch. The fruit and orange liqueur combination is just right, and will leave you craving more. Enjoy!